The Oktoberfest beer, served by the 6 breweries in Munich inside 14 large tents and 21 small tents is of the Märzen variety. Märzen is a low fermentation beer and can contain up to 6% alcohol and is in fact stronger and darker than traditional beer. As can easily be deduced from the name, it used to be produced in the month of March and in order to facilitate its preservation in the summer months, without being able to count on modern refrigeration techniques, it was produced and continues to have a slightly higher hop content, is more alcoholic, and can therefore be consumed during the months of September and October. The Oktoberfest is and always will remain typical of Munich. The rules of the Oktoberfest stipulate that during the festival, only beer products from breweries in Munich can be served. 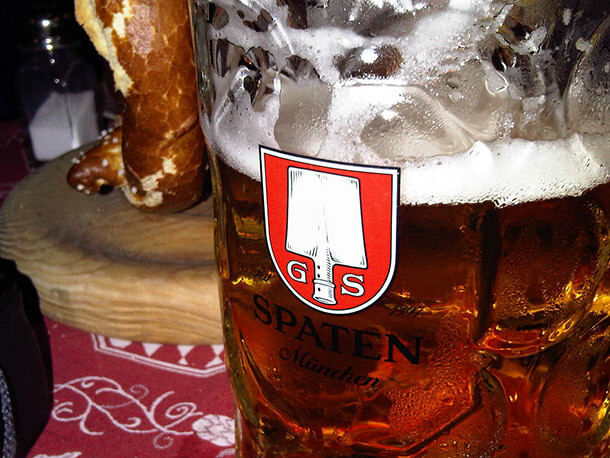 This measure is intended to ensure that the Oktoberfest still remains a Munich event in the future. In addition, the name “Oktoberfestbier®” is a registered trademark. The holder of this name is the association of the Munich breweries. The 6 breweries that meet these criteria, the “pillars” of the Oktoberfest are, Augustiner-Bräu, Hacker-Pschorr-Bräu, Löwenbräu, Paulaner-Bräu, Spatenbräu, Staatliches Hofbräu-München, all from Munich and producers of beer according to the rigid constraints imposed by the Edict of Purity. This is due to Louis X and especially to William IV, the two sons of Albert IV the Wise, as what has become known in history as the Edict of Purity (Reinheitsgebot). Enacted in 1485 for the city of Munich, the capital of Bavaria, the Edict of Purity was signed on 23 April 1516 at Ingolstadt, and specified that the production of beer throughout Bavaria was strictly bound by use of the following ingredients: barley, hops and water. Immediately evident is that yeast is not mentioned, i.e. the fourth raw material for the production of beer, considering that in 1516 the capacity of fermentation was still not known; it was in fact, only in the early years of the Nineteenth Century that Louis Pasteur discovered the purpose of micro-organisms in the fermentation process. The master brewers generally collect the previous fermentation at the “bottom” to add it to the next: this sediment usually contains the micro-organisms needed to activate the process. If none of these were available, more tubs were prepared and the yeast usually “appeared by itself”. Hops were added to the beer as a preservative, and its mention in Reinheitsgebot indicates the desire to prevent the poor conservation methods used prior to its implementation. Medieval brewers used many ingredients not suitable for the preservation of the beer including, for example, soot and amanita muscaria. Mort commonly other herbs such as nettles were used, “a relative” of the hops. In the “Reinheitsgebot” the price of beer is also fixed at 1-2 Pfennig (thalers) per Maß (i.e. a unit of Bavarian volume equal to 1,069 litres). The “Reinheitsgebot” is the culmination of the long metamorphosis of the laws, which endured over 200 years, regulating and governing the production of beer in such a way that there were no harmful substances or ingredients used that are essential for the exclusive and vital production of bread. The price of beer was also fixed thus guaranteeing a staple food for the population. Over the course of the centuries these laws were adopted by every German state. Later, in 1906, the same laws were also adopted by the entire German Empire and its successors continuing up to the present day. 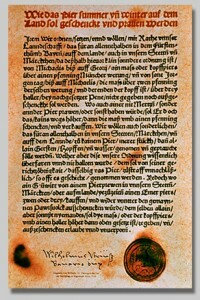 Even today, the German “Biergesetz” (“The Beer Law”), which in turn controls the production of beer in Germany, is heavily based on the “Reinheitsgebot”, which is still the symbol of high quality for excellence, even though it was replaced by the “Provisional Law on German beer”, (Vorläufiges deutsches Biergesetz), which allows for certain prohibited ingredients in the Reinheitsgebot, such as wheat malt and sugar cane, but no longer allows for the use of unmalted barley.